On opening night of the 2018-19 winter season at Valley Catholic High School, the Valiants defense did not just show up, it was a force to be reckoned with. The student section was packed Dec. 28 as the Valley Catholic boys basketball team took on Scappoose. The Valley Catholic defense harassed the Indians throughout, dominating its way to an 80-35 win. 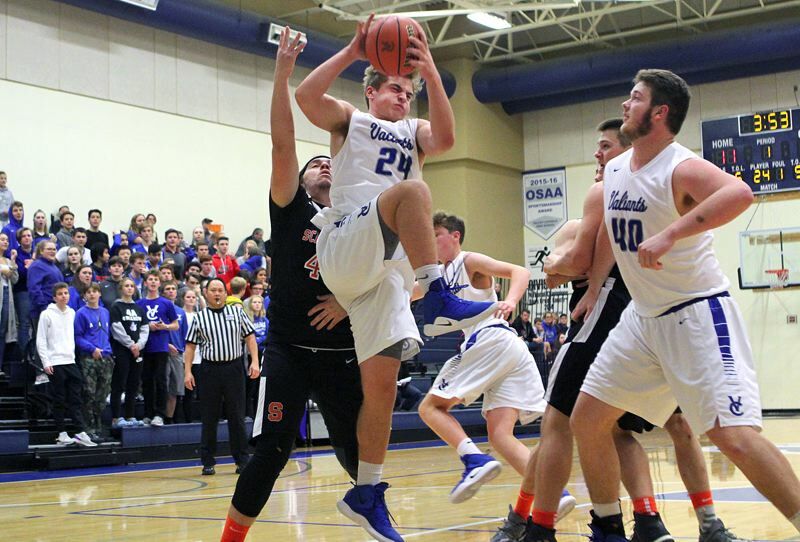 "With having so many returning guys, we knew what we wanted to execute coming in and we wanted to start the journey off on the right foot," said Valley Catholic senior guard Jack Tetzloff. "This was the first game of the season, and honestly, we haven't had that many practices," said Valiant senior guard Davis Johnson, who led his team with 17 points. "It was a really big win for us. Our teammates were so involved." Coupled with a 41-38 loss at Gladstone on Friday, the Valiants saw their early-season record move to 1-1. Scappoose, meanwhile, fell to 0-1 and doesn't return to action until Friday when it hosts Astoria in non-league action at 5:30 p.m.
"The loss is on us. It was an execution problem more than it was their defense," said Scappoose senior guard Connor McNabb, who finished with eight points. "We need to come out and work little harder in practice and play at a better pace." "We just need to become more comfortable at running our plays, which will come with better pace at practice," junior guard Jake Boyle added. The Valiants got off to a hot start against the Indians, going on an 11-0 run through the first 2 1/2 minutes of the game. Tetzloff used his quickness to weave through Scappoose defenders to score 10 of his team's first 11 points. Tetzloff started by scoring on a drive, hit a hanging shot in the lane, scored on another drive, then hit a floating right-handed shot to give his team an 11-0 lead with 5 minutes, 38 seconds left in the quarter. Tetzloff's offensive performance was backed by a strong defensive effort by the Valiants, led by Valley Catholic sixth man Trey Eberhart, who made three steals in the first half as well as scoring 13 points for the game. Scappoose — which missed its first two shots and made two turnovers on its first four possessions — got on the scoreboard when junior guard Jake Boyle rebounded his own miss and scored to make it 11-2 with 5:10 remaining in the quarter. McNabb made a steal and scored on a breakaway on the Indians' next possession, then hit one of two free throws to bring his team within 11-5 with 4:30 remaining in the period. But the Valiants dropped the hammer then and there, finishing the stanza on a 15-0 run that boosted their lead to a commanding 26-5 margin. Beginning with Tetzloff's basket from the left side with 3:35 to go in the quarter, Valley Catholic scored on seven of its final nine possessions, hitting 7 of 9 shots to leave the Indians behind. During that stretch, VC senior Peter Boileau scored on a putback, junior Trey Eberhardt made a steal and scored on the break, senior Isaac Flemmer took a pass from Johnson and scored inside, senior Jackson Miller finished on a fast break assisted by Eberhardt, Eberhardt connected at the end of a reverse spin move down the lane and turned it into a three-point play, and Boileau made a steal and scored in the final second of the quarter for that 26-5 lead. In that same stretch, the Indians missed their final four shots of the frame and turned the ball over four times. While Valley Catholic kept the pressure on in the second quarter and boosted its lead to 42-17 at halftime, the Indians began to find their offensive footing. Junior Jake Boyle scored inside off an assist from junior Tommy McKedy, McNabb banked home a runner in the key and added a free throw, senior post Terrence Lewis rebounded a miss and scored inside, senior Ian Johnson made one free throw, Lewis made 2 of 4 foul shots and senior Jordan Buchanan hit a right-handed bank in the lane to account for the Indians' scoring in the frame. On their end, the Valiants put the game on ice behind Johnson's seven points (he hit two foul shots, drained a 3-pointer assisted by Tetzloff and added a reverse lay-in), an effort that helped extend his team's lead to 42-17 at the half. "The way our defense played shows the kind of heart we have as a team," Johnson added. "We're all together, always working hard — it shows that we are in this 'til the end." The Valiants had four players score in double-digits and shot 71 percent from the foul line in the victory. Scappoose faced a struggle offensively against a lengthy and quick Valley Catholic defense, eventually led in scoring by Lewis, who finished with 13 points. The Indians struggled from beyond the three-point arc as well as at the foul line, only making two three-point shots and shooting 48 percent from the foul line. Next up for the Valiants, VC plays at West Albany at 7 p.m. Friday, then hosts North Marion at 7:30 p.m. Tuesday.